There’s still plenty of time to find yourself a valentine of the furry variety! The dogs at Orphans of the Storm® will love you forever if you give them the chance. Also, if you’d like to share your own love story this Valentine’s Day, help us add to our growing list of Success Stories and email meetthepooches@gmail.com to tell us all about your Orphans of the Storm® adoption experience! 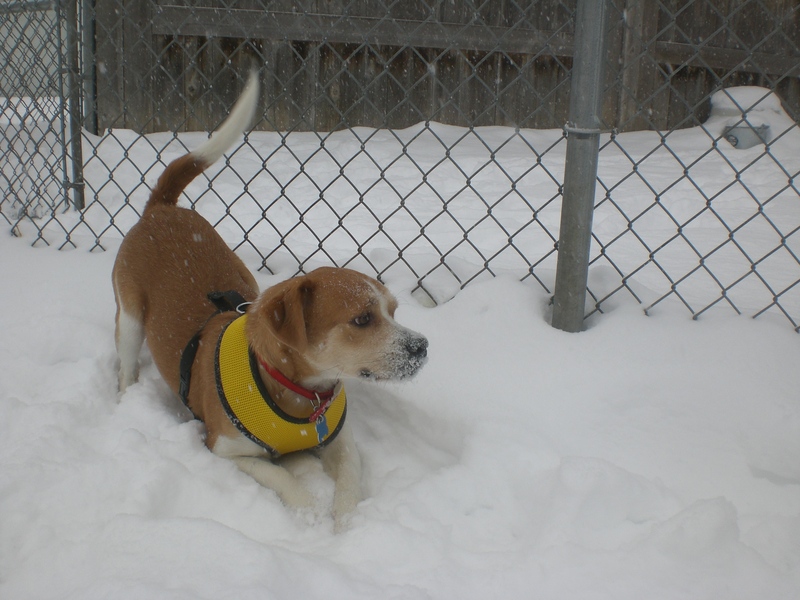 Babe the one-year-old Beagle mix is such a little cutie, especially in his bright yellow harness! He waited patiently for me to put his leash on, and then we were off and running. Babe was sharing his kennel with a dog who has since been adopted, so he could go to a home with or without another dog. 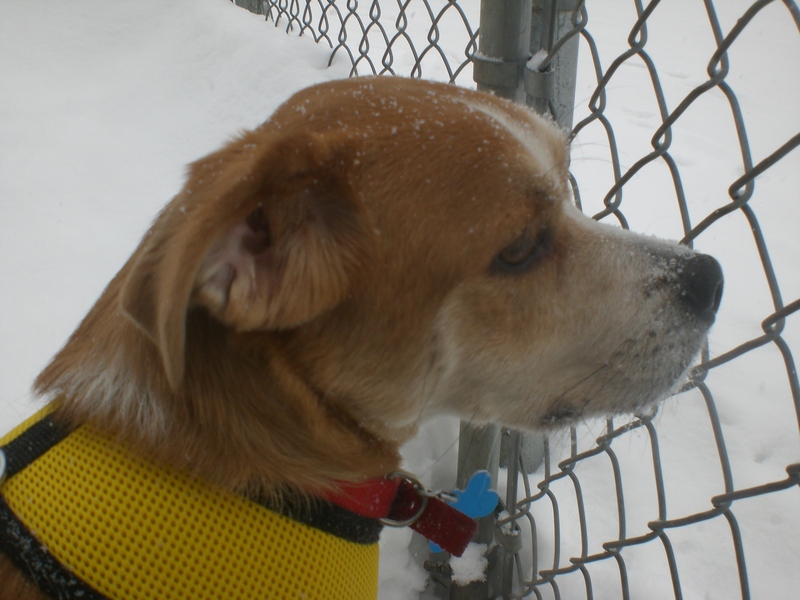 And don’t worry about Babe not liking this weather–he was sticking his face into piles of snow to discover new scents. Babe is an active, playful little guy. If you’re looking for a dog that you can train for agility, look no further than Babe! He was jumping up and over the snowbanks like they were no big deal (perhaps he is part bunny? ), and he’s certainly speedy. Once he’s had his exercise, he’ll be happy to sit in your lap and give you doggy kisses. Babe got snow all over my lap because he was so eager to snuggle! If you’re looking for an adorable young pup, come in soon to meet Babe. Babe has such a cute little face! 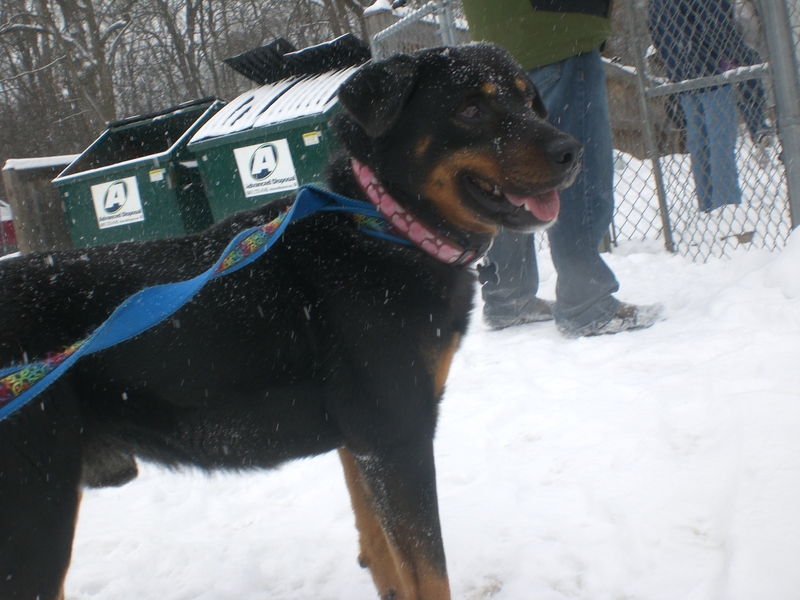 Sherman the four-year-old Rottweiler mix is a big sweetheart who is very people-oriented. He was a little shy when I first took him out of his kennel and stuck close to my side while we made our way to the off-leash run, sometimes stopping and waiting for me to give him an encouraging pat on the back. Soon enough, though, that pretty tail of his was wagging. Once Sherman got over his shyness, he wanted to say hi to everybody. If someone walked by the run, he’d put his front paws up on the fence and wag that tail. When another dog came into the run next to ours, he had a great time racing them. Sherman may be a little too big to be a lapdog, but that won’t stop him from trying. 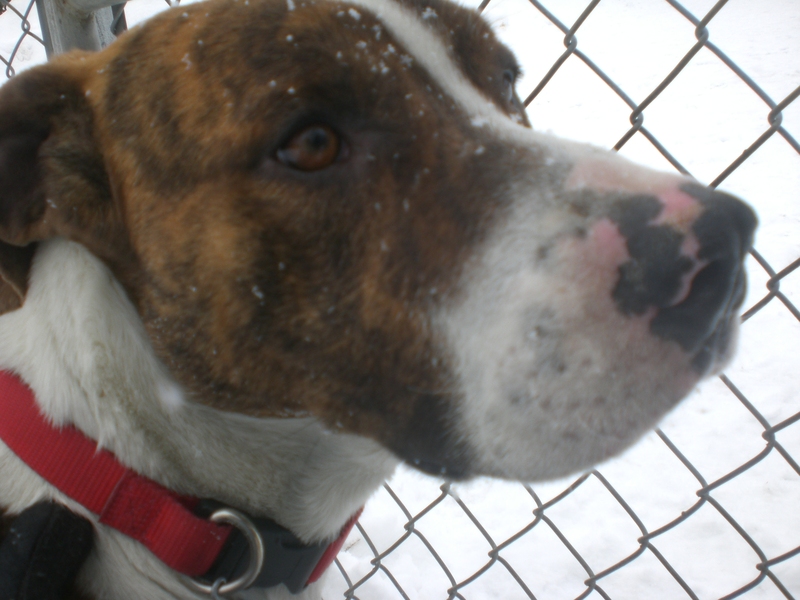 Give Sherman the chance to warm up to you, and you’ll have a loyal companion forever! 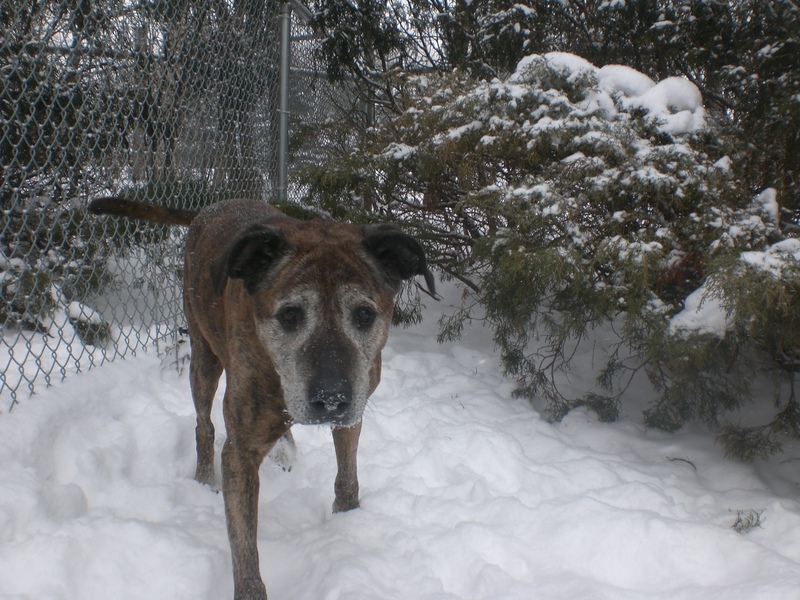 Molokai the twelve-year-old Hound mix certainly doesn’t act like a senior citizen! The only thing that gives her age away is the gray fur on her face. Although you’ll usually find her curled up on her doggy bed in her kennel, she perks up as soon as she gets outside. Molokai set a quick pace as we made our way to the off-leash run and was romping through the snow with no signs of slowing down. Molokai is an absolutely beautiful girl; she got lots of compliments from other visitors at the shelter because of her brindle fur. In between romps, she would come back to me for a nice scratch on the neck or ears and then set off through the snow again. Molokai isn’t asking for much–just a nice home with a nice family so she can enjoy her golden years surrounded by comfort and love. 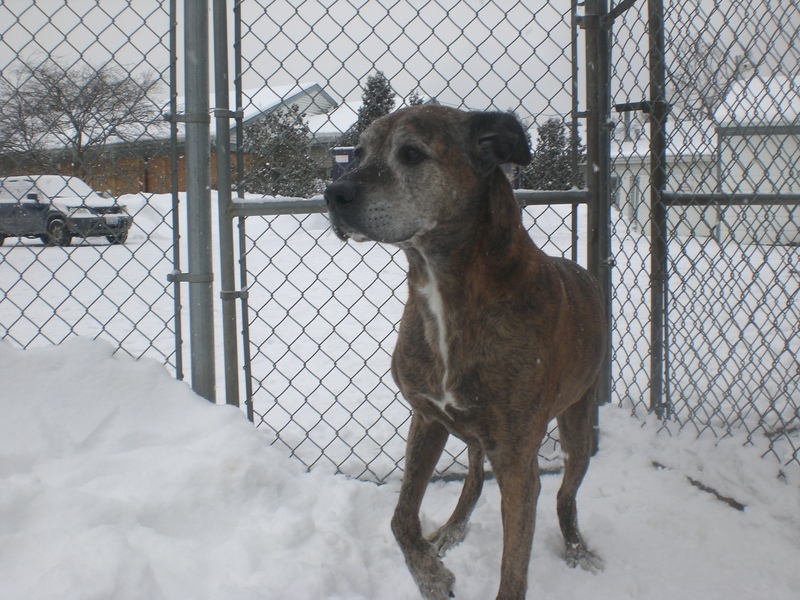 If you’re interested in a senior dog, stop by the shelter and say hi to Molokai! Bilbo Baggins the two-year-old Basset Hound/Mountain Cur mix is the type of dog who seems like he would get along with just about everybody. He greets everyone who walks by his kennel with a wagging tail and, once we were out on our walk, he wanted to personally say hello to everybody outside too! Bilbo Baggins is currently sharing his kennel with Jade, and had a different kennelmate before that, so he could go to a home with or without another dog. Bilbo Baggins has plenty of energy. He loved dashing through the snow and wanted to run around longer than my frozen toes could handle. Bilbo Baggins is also super affectionate. He will happily give you doggy hugs and cover your face in doggy kisses if he sees an opportunity to do so. This is one happy-go-lucky guy–I can only imagine how much joy he would bring to his new forever home! Come in soon to meet Bilbo Baggins! I also gave Ebbie (who is just the sweetest and gentlest) and Shasta (who has really started to come out of her shell now that she knows me) the chance to play in the snow for a bit. 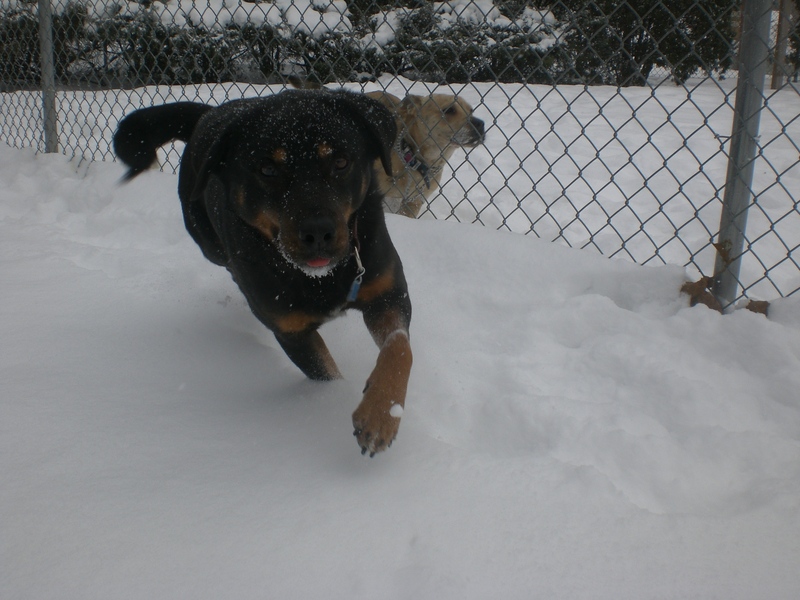 At least the dogs of Orphans of the Storm® don’t seem tired of this weather yet! 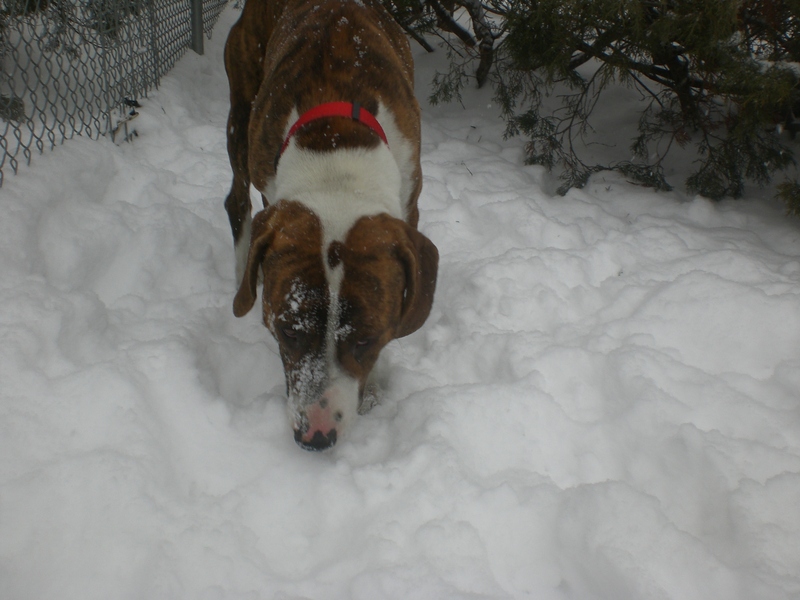 Posted by Meet the Pooches on February 13, 2014 in Dog Profiles and tagged animal shelter, animals, Basset Hound, Beagle, Chicago, dogs, Hound, Mountain Cur, Orphans of the Storm, pets, Rottweiler, snow, Valentine's Day.